This article originally appeared as a by-line in The Gaming Economy, found here. You heard the man – “personalised content and highly targeted messages”. One way to achieve this is to run an app retargeting campaign, to send your existing users highly targeted ads for your app while they’re browsing another app. The idea is that you send personalised, carefully crafted ads to each user, depending on their position within a funnel, rather than just serving up the same stale user acquisition (UA) ad to people who have already installed. You’re probably going to lose their attention pretty quickly. Good advertising should be a dialogue, not a one-sided bombardment. 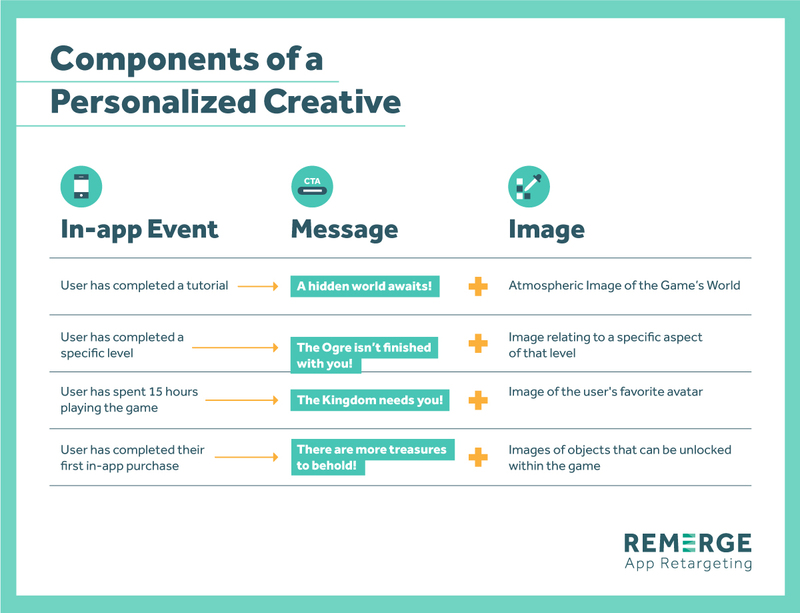 There are some key considerations and best practices for your game, when running an app retargeting campaign, including creative strategy, and what a typical, custom setup might look like for a gaming app. 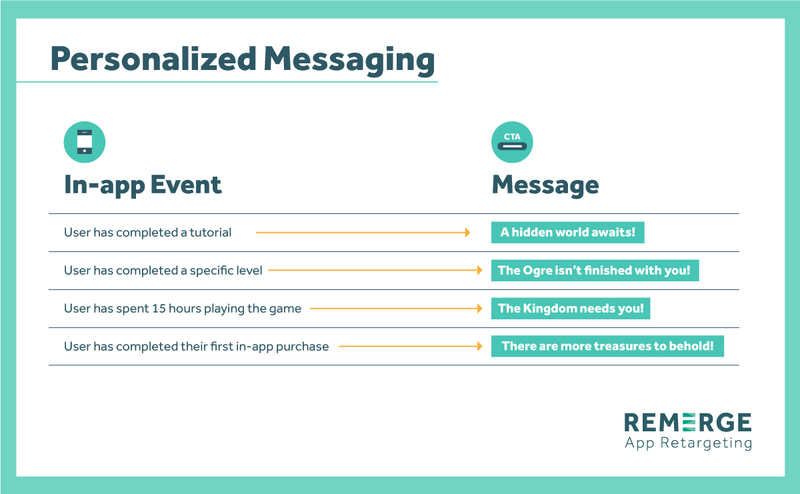 In this article, we’re going to give you a guide to executing this for your game by running an app retargeting campaign. So strapp in and get ready to apply yourself. Sorry – we promise that we’re better at app retargeting than we are at app puns. 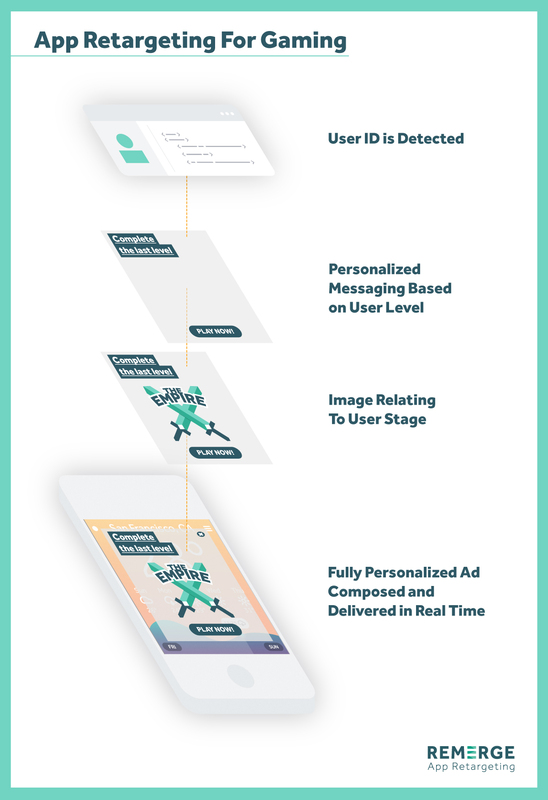 Personalised messages are achieved by targeting users differently based on the in-app events they have completed. Selecting which events you would like to track is the first step in setting up a campaign. In the e-commerce vertical, these in-app events might include: “User has viewed same product several times”; or “User placed product in the shopping cart”; or “User has drooled on phone screen while looking at product” – we’re not quite there yet, but we’re working on it. 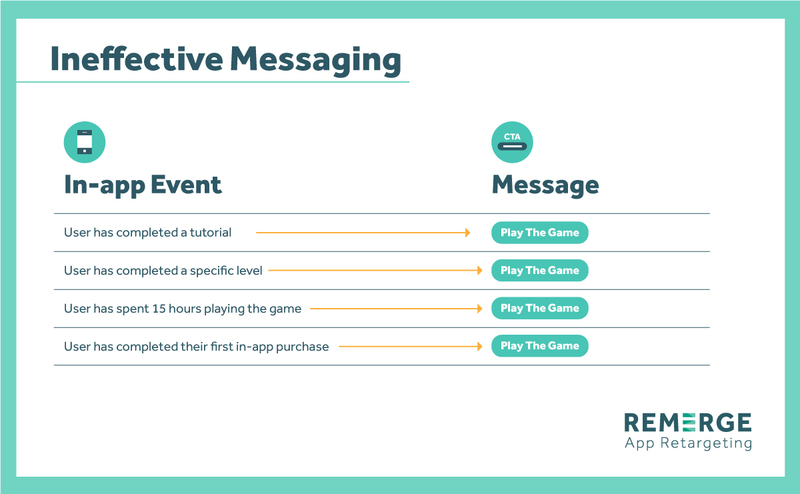 Based on these in-app events, you can target each individual user with a different message. So users who have just installed the app will see an ad encouraging them to complete a tutorial, while users who have completed level X will see an ad that specifically references aspects of that level (eg. setting, character, or prize to be redeemed) and encourages them to continue. “Dynamic” means that all of the above is done in real time, without the need for manual lists. This is achieved by leveraging your real-time data stream. When one of the in-app events appears in a user’s data stream, they are automatically targeted differently. You need to be working with an attribution provider for this to be possible. In doing so, you open a world of possibilities in terms of access to granular data. It gets a little repetitive, don’t you think? You need to customise your creatives to the same extent as your verbal messaging. Luckily, there are plenty of opportunities to do this. Let’s take our mythical example from earlier, and add some images. So, does this mean you have to make different creatives for every single one of the eventualities? No, that bit is dynamic too. With dynamic ads, your creatives are composed in real time, based on the user you’re targeting at that particular moment. So, if that user always chooses the Ogre avatar and has just completed the ‘Castle’ level, we’ll whip up a creative with the Ogre, the castle, and a message saying “Continue the quest!”. So, now that you know how it works, you’re probably wondering if it works. As with all marketing campaigns, the key is to track, measure, and optimize. Run tests to compare the performance of dynamic ads with that of the static ads. Track how retargeted users behave in your app, in comparison to other users. And remember: app retargeting is a very different ballgame to user acquisition – the focus is not on generating an endless supply of users, but on finding users who will participate in, engage with, and thrive within your app; and so you will need to adjust your success metrics accordingly.